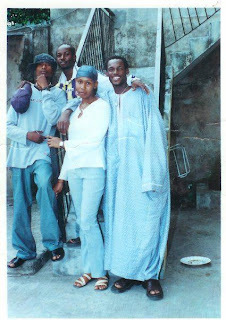 Check out the current millionaire singer in nigeria, here's an old photo of him with his ex-crew members/ex-girlfriend. Days have really gone by and these men has got to thank their stars for the advancement in the entertainment industry in Nigeria. This is a photo of the trio we all know as Plantashun boiz. From the Left is Faze, Blackface, Ex-Girlfriend and 2face. We noticed a plate on the ground, button right. We don’t know who used it but we are suspecting 2face because he seems to have a bigger smile on his face more than the others.